P&O Cruises Australia has introduced its two latest ships, Pacific Aria and Pacific Eden, expanding Australia’s largest year-round fleet to five cruise ships. Both ships were christened in Sydney via the popular social networking site Twitter. With the addition of Pacific Aria and Pacific Eden, P&O Cruises Australia now has five ships cruising year-round from eight homeports in Australia, New Zealand and Singapore. 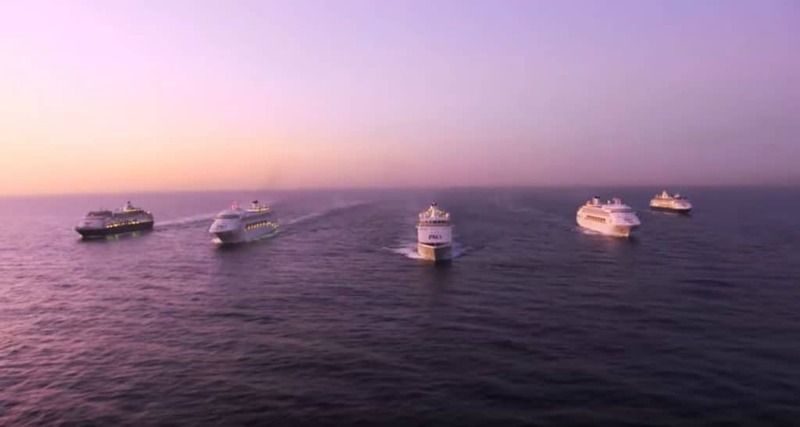 During the celebration to welcome its two latest ships, Australia’s leading cruise line made history by staging two first-ever events: a five-ship spectacular in the world-renowned Sydney Harbour and a social media naming ceremony. With Australian cruise passenger numbers having grown by an average of 20 percent a year over the past decade to break through the one million mark in 2014, P&O Cruises Australia is well positioned to continue meeting Australians’ surging demand for cruise vacations. The addition of Pacific Aria and Pacific Eden has paved the way for exciting new cruise options including deployments from every mainland state in Australia, an extended deployment from Auckland and a season of cruising from Singapore. P&O Cruises marked the debut of Pacific Aria and Pacific Eden with a social media naming ceremony, which saw popular Australian singer Jessica Mauboy and actress Kate Ritchie simultaneously christening the ships via Twitter as the two vessels sailed by Fort Denison, in the middle of Sydney Harbour. Notable cruise industry officials and two special guests attended the ceremony – young Sydney sisters Aria andEden Mulligan, invited by P&O to perform the role of “junior godmothers” for the sister ships, which coincidentally share their names. In a nod to maritime tradition, a bottle of Champagne was smashed on the bow of each ship as they sailed by Fort Denison, with all five ships sounding their whistles to mark Australia’s first dual cruise ship christening. Thousands of Sydneysiders watched the cruise ship spectacular from the shore, while more than 12,000 guests and crew onboard the five ships joined in the celebrations. The five ships remained in Sydney Harbour all day, with guests onboard enjoying a series of live concerts from more than 25 music acts, including performances by leading local performers Jessica Mauboy, The Veronicas, Justice Crew, Samantha Jade and Stan Walker. The celebration concluded with a special fireworks display above the harbour. Designed to be game changers for the Australian cruise industry, Pacific Aria and Pacific Eden offer a relaxed vibe in a contemporary and stylish setting. Both ships feature a range of dining options, including the revolutionary new Pantry, which replaces the traditional ship’s buffet with an international food market showcasing eight delicious outlets. Other onboard offerings include stylish new lounges and bars, a stunning poolside area, new Pandora jewelry boutiques and a range of entertainment options including Bianco, the new P&O White party. Continuing the cruise line’s modern Australian evolution, P&O Cruises has another ship on the horizon to be named Pacific Explorer. The ship will build on the fresh and contemporary design of newcomers Pacific Aria and Pacific Eden. The 77,000-ton ship, currently sailing as Princess Cruises’ Dawn Princess, is scheduled to enter the P&O Australia fleet in May 2017 and will sail from Sydney during its inaugural season. Details of its sailings will be released in the near future.